Two-thirds of a Junkyard Dog, a concoction that includes a hot dog, chili, cheese, onions, Fritos and French fries. A real Junkyard Dog is a foot longer than the two-foot creation pictured. Pit master Sonny Woods holds two-thirds of a Junkyard Dog, a concoction that includes a hot dog, chili, cheese, onions, Fritos and French fries. A real Junkyard Dog is a foot longer than the two-foot creation pictured. Hawg ’n Dawg Express has a combination its owners think will be an instant winner. 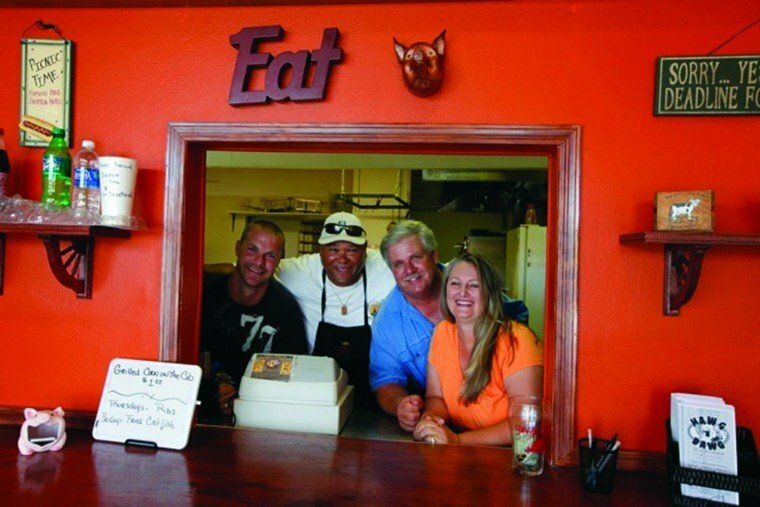 “It’s two things people love: hot dogs and barbecue,” said co-owner Sonny Woods. 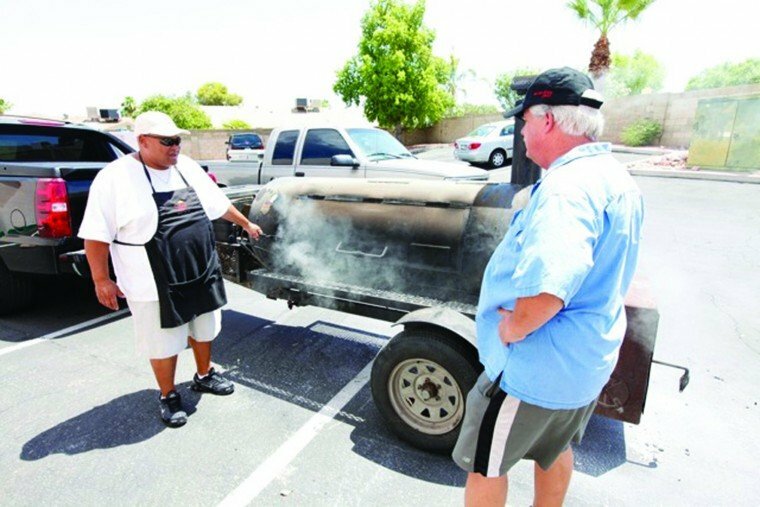 And with high-quality hot dogs, unique toppings, a huge smoker and barbecue, Woods and co-owners Andy and Sandy Jerdee believe their Ahwatukee Foothills neighbors will keep coming back. The store has only been open for seven weeks in a small storefront tucked into the back of a strip mall right at the Elliot-Warner Loop. But it has already been embraced by members of the community who have come across it. Andy and Sandy Jerdee wanted to open a restaurant close to home, having lived in Ahwatukee for about 20 years. Woods and Andy Jerdee have been friends dating back to their days as classmates at Chandler High School, so he’s also quite familiar with the area. “The people around here are glad they don’t have to go far for a good hot dog,” Andy Jerdee said. About 70 percent of the business is take-out so far, which makes sense, since the small lobby area can only hold a few tables. They hope to expand that area in good time, Sandy Jerdee said. Andy Jerdee has a long history in restaurants, having managed restaurants from Macayo’s to KFC and doing some catering, among other ventures. Sandy Jerdee has helped with more recent endeavors, but mostly comes from the business world, including some time in the classified department of the Ahwatukee Foothills News. The Jerdees secured the small shop about a year ago with the intent of catering lunches for local charter schools, but after taking 10 months to get the restaurant ready, they called up Woods and proposed a hot dog and barbecue venture instead. Woods has owned three different barbecue places in Arizona, including Scott’s Barbecue in Ahwatukee in the 1990s. Woods is the pit master in addition to being a co-owner. His love of grilling dates back to childhood, when he remembers his grandfather grilling an animal he slaughtered himself every weekend to feed the entire neighborhood. “It’s something that was a family tradition, being able to cook. It’s something I kept ongoing,” Woods said. Woods uses that grill for all kinds of items, including smoked chicken wings, which have been very popular. He’ll also do veggies, and grilled a lamb and pig for a friend’s event recently. “People come in and say, ‘Can you do….’ And we never say we can’t,” Sandy Jerdee said. But as the name implies, Hawg ‘n Dawg’s most popular menu items are their hot dogs. The restaurant features Eisenberg Black Angus Sirloin hot dogs, which is a very high-quality dog sold at the Chicago Cubs’ home stadium, Andy Jerdee said. “If it’s good enough for Wrigley Field, it’s good enough for Ahwatukee,” Andy Jerdee said. The toppings also make Hawg ’n Dawg Express unique. One popular item is the Green Hornet, which features Hatch green chiles and a jalapeño cream sauce, Andy Jerdee said. And then there’s the Junkyard Dog. This 3-foot dog is nestled in an extra large bun and smothered with a quart of chili, bacon, cheese, onions, Fritos and French fries, Andy Jerdee said. And that was before they had the special 3-foot buns in, so he didn’t even get the whole effect, Sandy Jerdee said. The first person to eat the whole thing in one hour will get $50, the $16.99 cost of the Junkyard Dog refunded and their picture on the store’s Wall of Wieners, Andy Jerdee said. Hawg ’n Dawg Express is open 10:30 a.m. to 7 p.m. Monday through Saturday at 12020 S. Warner Elliot Loop. The restaurant offers business delivery 10 a.m. to 2 p.m.